Each year we get together a collection of reminiscences of ‘Christmas Past’ in Brighton. We are sure that they make entertaining reading on the site and provide an distraction from the cold turkey sandwiches! Do you have a special memory of a Brighton Christmas? What was your best Christmas? Did you ever have an awful Christmas: maybe you burnt the turkey? Perhaps you have got some interesting festive photos? So forget the Christmas shopping for a little while and take the time to share your memories with us. If you have any Christmas reminiscences to share you can add them to the site. If you look here you can find out how to do that – it is very easy! Brighton Sorting Office in the 1950s and 60s employed over 1000 casuals at Christmas. The bulk of these were employed sorting the primary and roads. On the 24th of December the Postmaster would come down on to the floor, give us permission to smoke, tea and cakes were supplied free of charge. Then the Salvation Army band would arrive and every one joined in singing carols until it was time to go home. My favourite evening was a visit to the Regent Ballroom which looked fantastic. Even the toilets were posh and us girls loved sitting doing our hair in such plush surroundings! The music was ace and the main band and the small group all played the pop music of the day and we danced non-stop. Great memories for so many and I was shocked when the building was demolished to be replaced with Boots the Chemist! I remember the beautiful decorated lights that were strung up all along Western Road, magical. One evening whilst sitting on the top deck of a bus one of the lights came crashing down – very exciting at the time. I don’t think anyone was hurt. I think the lights came from London’s Regent St, this was about 1959. I remember the Christmas of 1967 as a mod great times.The building directly behind the Clock Tower was opened as an American style automat. You could buy anything you wanted out of a machine. Straight out of the Regent Ballroom into the automat (great). Glad I found this picture of the Clock Tower and glad you listed it as 1967. I see the sign ‘LEWIS’ hanging on the right side. I went to work there in 1968. It was then called Lewis Seperates selling ladies underwear, blouses, etc. A small shop on two floors. About a year later they up-graded it inside to a funky boutique with black painted walls and zany coloured spotlights and re-named it ‘Chelsea Girl’. Our uniform was the shortest red mini skirt known at that time and the music was off this planet. Shops were starting to ROCK. 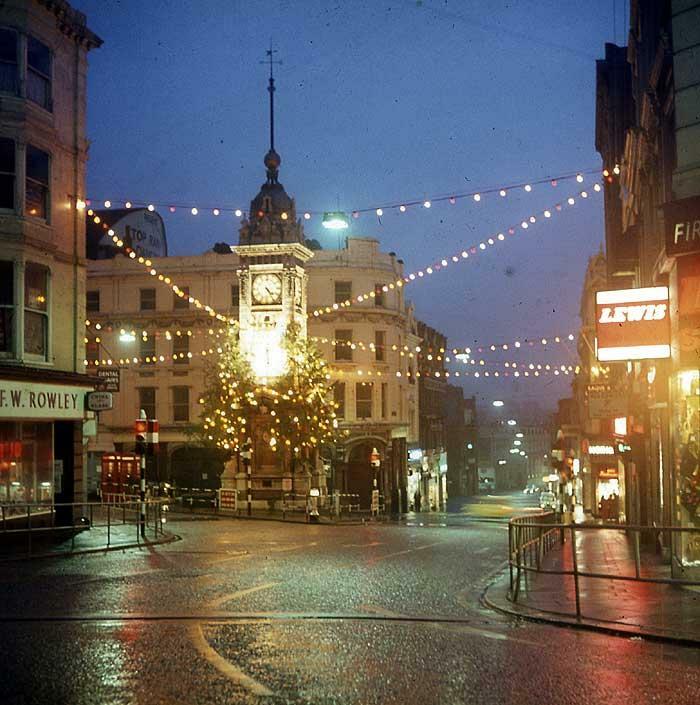 As a young child in the early 1960’s, I hazily remember the Christmas decorations along Western Road. Could the theme possibly have been ‘Nursery Rhymes’? I recall being fascinated by pictures at the top of poles lining the road, one clearly being Little Tom Thumb pulling out a plum! My twin sister can’t recall these at all and says I must have imagined them all! My Mum and Dad took me and my sisters each Christmas on a trip on the Trams, the lights on them and in the trees stay in my memories till this day and also the wonderful fountains changing colors. I can remember going to the the Grand Theatre to see a pantomime when I was about ten years old. My father took my sister and me and half way into the show my sister was ill and we had to leave and they gave us tickets to go another night. It was a shame when they closed it down. Does anyone else remember the Grand? This is exctaly what I was looking for. Thanks for writing!